Now that Google Reader has disappeared, Feed Wrangler is a great replacement, providing both a web site and iOS apps. My favourite feature is the one-tap send to Instapaper button, added to the bottom of the iOS app when you sign in to the read it later service. I’ve just started reading Structure and Interpretation of Computer Programs, and have been struck by how they introduce a couple of rather advanced concepts in such a clear way, hardly even hinting at how tricky these concepts can be to understand, particularly in other programming languages. Depending on the value of b, the two operands are either added or subtracted. This is a powerful way to introduce functions as first-class citizens. The second was how naturally recursion is introduced as a problem solving mechanism. In fact, the first time it’s used, I don’t think it’s even named! Recursion is a very natural approach to solving mathematical problems using computers, and coming from imperative languages like Java, seeing recursion used so simply in the very first chapter of the book was really refreshing. A final thought - I think Scheme is perfect as a teaching language. As the authors say, the syntax is so simple that it just gets out of the way and allows a concise exposition of all the necessary concepts of programming and computation. I’m looking forward to working through the rest of the book. A list of the services, software and hardware that I use every day. The best days are the ones when I don’t do anything in OmniFocus. What do I mean? When I’m living, I’m not worrying about my task list. I know that nothing is due. Nothing is going to fall apart while I’m away. This is the best part of GTD – the mind like water. Whilst it’s not something that happens as often as I would like, I really appreciate it when it does happen. It makes me strive to improve the way I manage my “open loops”. I removed Daring Fireball from my Google Reader for a while – the post volume is high, and to be honest, I’m more interested in “productivity” than technology news – but I recently resubscribed, and I’m glad I did! John’s snappy comments, and insightful view into the business side of technology make it well worth following. Tulio Jarocki has a great set of TextExpander snippets for writing reviews in DayOne. I think keeping reviews of books and movies in DayOne is a great idea. When watching the video of Koroush Dini speaking at The OmniFocus Setup, one thing that came to mind was how GTD (and OmniFocus) lets you accomplish small wins, where you knock a load of tasks off your list early in the day. This frees you up to tackle what Koroush describes as creative tasks, tasks where you don’t know what you are making until you have made it. I love taking lots of small steps to make progress on projects early in the day, and feel like it removes the obligation to “accomplish” anything when I’m working on a more creative task later in the day. Creative tasks that I come up against are normally writing papers and debugging code, both of which can make it hard to feel like you’ve achieved much. When I’m safe in the knowledge that I am getting stuff done, I feel better about working on these open-ended challenges. For those of us comfortable with the digital age, the plethora of note-taking apps makes idea capture fingertip-convenient. I’ve used Evernote for work purposes and keep most of my idea files in Google Docs. But that said, my first medium for idea capture is still pen and paper—usually in a highly disposable three-by-five paper notebook that I carry everywhere and fill up at a rate of about one a month. This is partly a function of immediacy (I don’t have to open an app and find a file) and partly a function of the fact that I’m terrible at typing on a smartphone and it takes me longer to get the words down if I try to do it digitally. This is a good reason to prefer paper. Whilst apps like Drafts do make it easy to quickly capture (and later process) text snippets on iOS, there is still a delay between thought and capture. But I also like the romance of physical handwriting, even though my atrocious penmanship falls somewhere between “five-year-old” and “average medical professional” and this sometimes means I’m unable to decipher pieces of what I wrote. I concentrate less when I’m typing and my first drafts often have missing phrases because my fingers have failed to catch up with my thoughts. Writing things down enforces slowness, and by extension, thoughtfulness. This romance, the nostalgic desire to use paper and pen, is probably one of the most compelling. Despite writing from a productivity context, there is something enticing about the feeling of abandoning systems and processes, and just capturing ideas like people have done for hundreds of years. My main issue with keeping a paper notebook, as I’ve mentioned before, is the fear of losing something. Without the powerful searches that are ubiquitous in our digital tools, what might happen to those thoughts? This ties back to the romantic aspect of the notebooks - locking thoughts away in a notebook, waiting to be liberated. What is the difference between something being clear, and something being simple? In writing, people might say they strive for simplicity, but perhaps clarity is more important. It certainly sounds better. It’s all too easy to get lost in a sea of long words and complex sentences. Why do people strive for simplicity yet end up in the weeds? This is incredibly common in academic writing, where it’s believe it’s driven by fear. “Impostor syndrome” is often mentioned in relation to grad students and academics; using the most complex language you can muster is just one more way to prove that you belong. How can you decide whether your writing is clear or whether it is simple? I should probably just distinguish exactly what I mean here. Clear writing is writing that is easy to understand. Not childish, and not over complicated. It is appropriate for the context, content, and audience. Simple writing is too simple. That sounds reductive, but what I mean is that it has none of the situational awareness of clear writing, the very property that makes clear writing so good, and so difficult to produce. The problem with the lack of clarity in writing lies in people worrying that someone will mistake their clear writing for simple writing. Or maybe even think that they are simple. The only way to avoid this is to forge ahead. Write clearly, don’t overcomplicate things, and ignore anyone who tries to criticise the direct nature of your words. Tyler Reinhard’s system for dealing with notes is perfect. It’s well thought out, and well documented. Reading through the post inspired me to try and improve my notetaking, and more importantly, my note processing. Having notes named like this makes it very easy to sort by name in nvALT and see all the notes you still need to process. The filename-based scheme works really well with Drafts, especially since they added variable support to file names in a recent update. 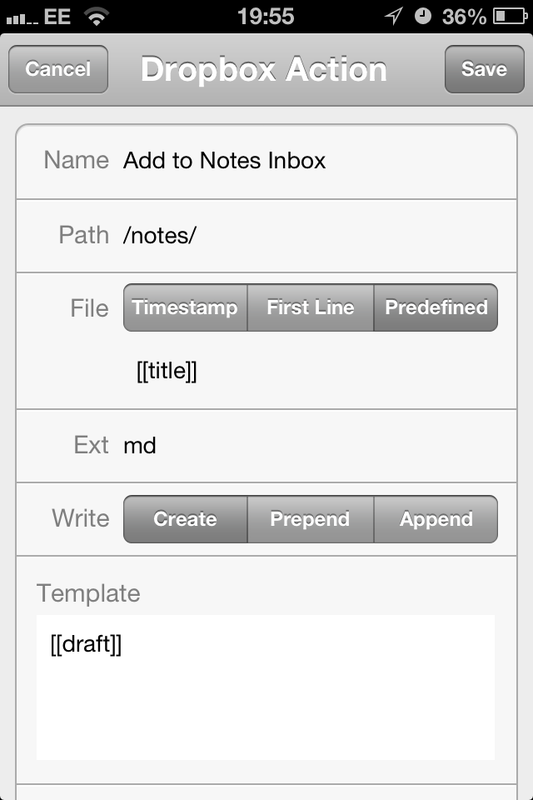 Using the “Predefined” file option, in combination with the [[title]] variable means that the note will be named correctly, and then saved to my ~/Dropbox/notes folder. It will then show up in the right place, and hopefully get processed. Combine the speed and Unix power of the shell with the convenience and added functionality of Finder! This a great little bash function from Brett Terpstra to cd into whatever directory is currently open in Finder. This is perfect for coding where you want to visually explore the project structure before jumping in and making some changes. This post from Oliver Emberton really struck a chord with me. As someone who often takes a long time trying to make the perfect decision, the ideas here, although presented in a quirky way, could really make a difference. What’s the first thing you do when you start a new project that will have a significant analogue component? If you said—“Grab a new notebook!”—then you’re not alone. This need to start a new notebook for every project is fuelled by the desire for organisation. Compared to digital documents, which can be easily copied, aliased, moved, filed, or trashed, going back to paper seems like a giant leap backwards. When you write something in a notebook, that’s it. So you sure as hell better stick it in the right notebook. This organisational paralysis is completely unecessary, since wherever you write your mind maps, outlines, or doodles, you will be able to liberate them. But knowing that doesn’t really help. We are spoilt by the ubiquity of search for digital information. If the piece of information exists, whether it’s on the internet or your hard drive, you will be able to find it. How can you search a notebook? You could try writing the start and end dates on each notebook. It’s fairly easy to remember the rough period of time you had the idea, so you should be able to find it again if necessary. Instead of buying more notebooks, I’m going to use the ones I’ve got, cramming them with as much information as I possibly can. And when I run out, I’m going to buy a plain pad of paper. Pads of paper are cheaper and more functional than notebooks. You can stockpile them for volume discounts; but resist the urge to keep starting a new pad for each project. Overpriced notebooks may be alluring, but they don’t make organisation easy. If you have a simple pad of paper (or even better, one with perforated sheets) you can just tear anything useful out and file it somewhere more permanent. Don’t panic if you want to tear something out and not do anything with it. I know that, although minimalism (especially in terms of possesions) has taken hold, getting rid of ideas is hard; it doesn’t need to be. You can treat each sheet of paper like an inbox item, and do it, delegate it, defer it, or delete it!